Elevated between 4429 ft and 10958 ft, the Ski Resort is among the 3 highest elevated Ski Resorts in Austria. The vertical drop from summit to base is 6529 ft. The average difference in altitude between base and summit of Ski Resorts in Austria is 2392 ft. Most runs are therefore relatively long. 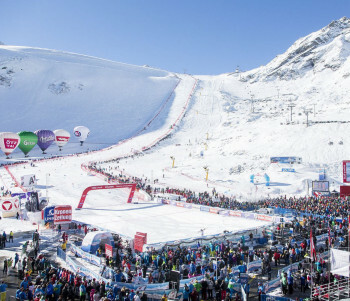 Sölden is among the 15 best rated Ski Resorts in Austria. Season starts on Oct 3 and ends on May 5 (214 days). Average season duration in Austria is 114 days. Average snow depth during the season (Oct 3 to May 5) is 94 " at summit elevation and 5 " at base elevation. Snow coverage is usually best during March, offering an average snow depth of 130 " at summit elevation and 7 " at the base. 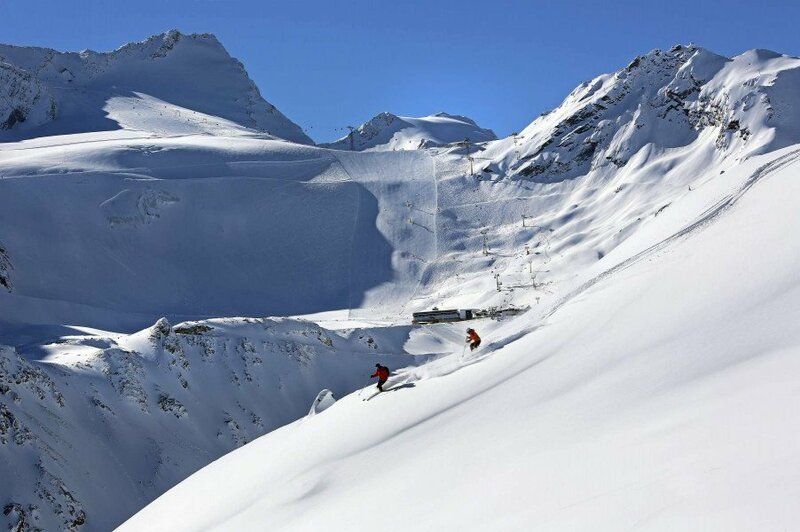 This makes Sölden the ski resort with the best snow conditions in Austria. Sölden features 104 sunny days on average per season. 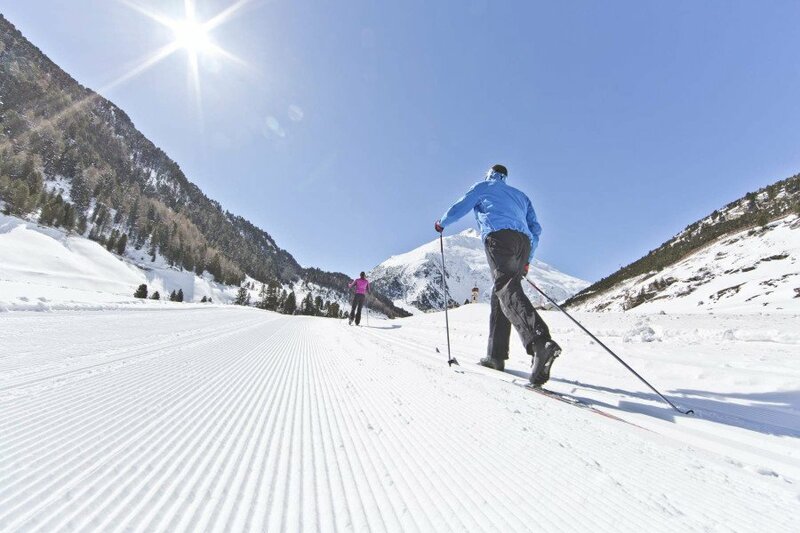 The average for all ski Resorts in Austria is 94 sunny days. April is the sunniest month with an average of 22 sunny days. 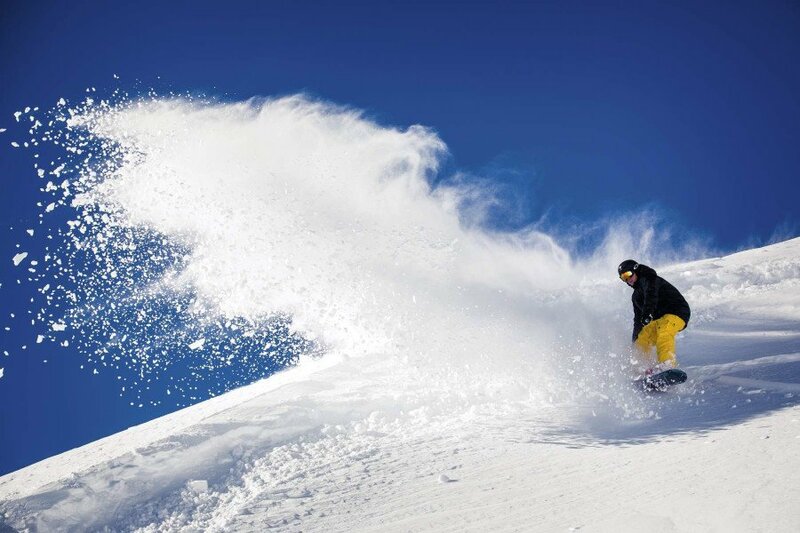 Offering 88 miles of slopes and terrain, Sölden is among the 15 largest Ski Resorts in Austria. 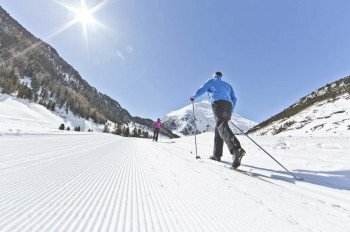 Sölden is definitely one of the hottest spots for skiers in Austria. Next to legendary Apres-ski and countless top events like the ´Electric Mountain Festival´ or the glacier spectacle Hannibal, the sportive challenges are also worth the travel. 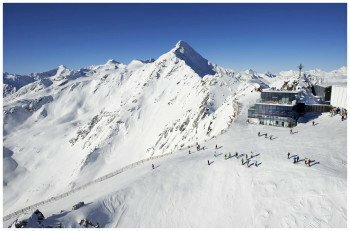 Thanks to the glaciers it´s possible for Sölden to open up before the other two Ötztal ski resorts open their lifts. Use the one and only glacier swing of the Alps between Rettenbach glacier and Tiefenbach glacier to explore the incredible 33 kilometers (20,5 miles) of pure skiing pleasure from September to May. This area does designate mostly blue runs so beginners won´t feel overwhelmed. Beginners just want to steer clear of the black marked trail at Rettenbachjoch. This is a really challenging slope that will even make the best skier´s think twice and is regularly home to the World Cup races. From November on the offer extends to 144 trail kilometers (89 miles). It´s top elevation of almost 3.340 meters (10958 feet) and the snow-making machines that cover almost 70 percent of the runs guarantee to always have perfect snow conditions during the entire season. You have access to the trails from Gaislachkogl or Giggijoch valley. However, beginners should decide for the second option. Once you made it up the mountain with the gondola above Hochsölden beautiful blues lie right before you. You can also grab the Silberbrünnl chair to switch to the easy glacier runs. Away from the hassle, check out the beginner area Innerwald to practice your first curves close to the Gaislachkogl lift in the valley. 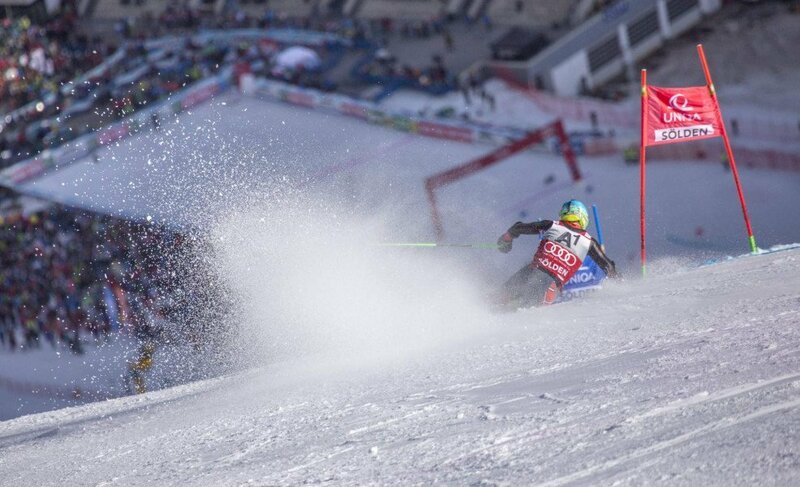 All those who already have gained more experience in the winter sport scene can enjoy the ski circuit. The fact that here are three mountains that are higher than 3000 meter (9842 feet) make this resort extra special. Hit the Big3 Rallye to experience that particular feature. Off you go on 50 kilometers (31 miles) of trails from the Giggijochbahn base station to Gaislachkoglbahn. Find your way to all three mountains of the ´Big3´: Gaislachkogl (3058 m=10032 ft), Tiefenbachkogl (3250 m=10662 ft) and Schwarze Schneide (3340 m=10958 ft). Follow the signs on the circuit to make your way through the whole resort in one day. Where the mountains top out at the highest point skiers find observation decks. More challenges for experts are at Gaislachkogl and Hainbachjoch. Whether it´s your first time sliding or you´re ready to go pro, Area 47 in Sölden is the right spot for you. From the Heinbachkar chairlift at Giggijoch you have access to the terrain park that boasts an area of unbelievable 6 ha. There are enough features to bring a smile to every freestyler´s face by featuring rails, boxes and kickers. Use the ´Chillarea´ to wind down your day with great music and comfy deckchairs. Refreshment needed? There are more than 30 restaurants across the mountain where delicious food and drinks are served to make your day a perfect one. The widest selection boast the two self-service cafeterias at the top station gondola Giggijochbahn. On two levels you will find everything your heart desires: Apart from the typical mountain fare you can enjoy pizza, schnitzel and apple strudel. Generous sun decks are also a reason to come here. An other self-service cafeteria that is famous for pasta dishes is Schwarzkogl at the Einzeiger chairlift. At the Gaislachkoglbahn I top station, you´ll find Tiroler Stubn beckoning you in for a break. Relax recharge and enjoy the traditional Tyrolean specialties and the comfortable atmosphere. A highlight for all gourmets is the 2013 newly opened Ice Q that convinces with food on the more sophisticated side and wine types that you only find once in a blue moon. Sit back and absorb the beautiful panorama at an altitude of 3048 meters (10000 feet) through the glass fronts. Sölden´s winter hiking trails are great. A total of 30 kilometers (18,6 miles) are groomed and signposted. The panorama trail and the route to Hochsölden are at the top of the list. If you want to slip in your snowshoes, you can hit the 18 kilometers (11 miles) in the resort that are especially designed for snowshoe hikers. Tobogganing fans find the natural run at the Stallwiesealm open during the day and at night you can try the five kilometer long run from the Gaislachalm back to Sölden. This one is even open until 1:30 am. The perfect activity for adrenaline junkies: paragliding. Starting point for this extraordinary experience is the top station Giggijochbahn. Out of the cold, into the leisure center Sölden that includes a tennis court, a gym, an adventure pool and wellness areas. An other highlight is the Aqua Dome, that is only 10 kilometers away, located in Längefeld. The only thermal bath in Tyrol features a huge water world, sauna and countless wellness offers on 50.000 square meters (538000 square feet). The Apres-ski ambiance is overhelming by giving the right answer to everyone´s taste with featuring around 30 bars right on the mountain. The bar Rettenbachgletsche is usually the choice of the locals and seasonnaires by boasting a great lounge atmosphere and a great view of the surrounding mountain world. The Gletscherbar at Tiefenbachgletscher invites for a Jagatee to end your successful ski day. Gampe Alm or s’Stabele umbrella bar at the Langegg chair are great bars that get the party started started early on the trails. Not only the mountain but also the town is a perfect hangout for happy hour. 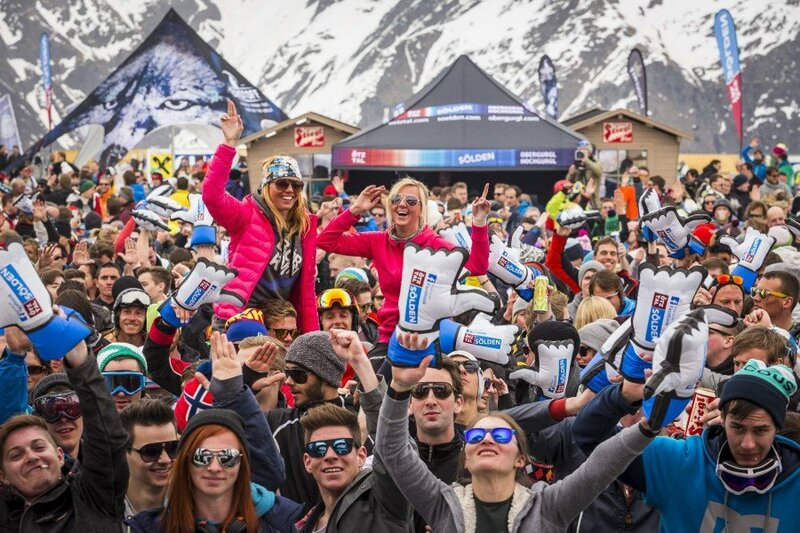 The main road in Sölden has tons of bars and clubs lining. Around 30 bars and 8 clubs wait for thirsty party people. If you decide for a typical Irish Pub, night hit Lucky Shags that welcomes with Guiness and Kilkenny. For all those who want to dance through the night the Fire & Ice is warmly recommended. It´s open until the crack of dawn and the best Djs and entertainer feel homely here. The Apres-ski in Mogul starts straight ahead after lift closing times and you get to hear every kind of music, from the newest charts to house and rock- there´s something for every taste! The open-air club Marco´s is a good alternative to hot and stuffy clubs in town. Black& Orange is the right address for all rock-lovers. Almost 40 restaurants spoil their guests away from the trails in Sölden. A well-known meeting point for gourmets is the culinaria. They mostly serve food using local ingredients. The menu also changes seasonally to adapt to the freshest Austrian grown products. The adjacent delicatessen shop offers all the food you need to copy the dishes you've just tasted in the restaurant. The wine & dine has a menu full of specialties to even please the most spoiled foodies and above all the matching wine list to give everyone a great restaurant experience. You get the best fondue and raclette in town right here. Local food serves Ötztaler Stube. The alpine cuisine of touquet chef Gottfried Prantl isn´t complete without beef and brook tout. You can get to Sölden easily via the Inntal freeway (A12). Take the exit Ötztal and follow B186 for 35 kilometers (21,7 miles) to Sölden. Vignette-free is the way via Füssen (B179) or Garmisch-Partenkirchen (B187) to Lermoos and then continue to Imst. From there you want to take the Tiroler Straße (B171) to Ötztal and after continue on B186 to Sölden. The Ötztal has its own train station. You can get here by taking regional as well as Intercity and Eurocity trains. From there you can take buses to Sölden or you can alternatively book the Ötztal Shuttle. The Innsbruck airport is about an hour away. From here you can take Public Transportation or again, the Ötztal Shuttle, to Sölden.